Are you new to Kickstarter? No problem, this blog post will quickly give you all you need to know about how to donate money or preorder one of the garments of the collection. Here is a step by step guide on how to back my kickstarter, followed by some backer FAQs. HOW DO I BACK YOUR KICKSTARTER? I'm glad you asked. Here is a detailed breakdown of steps. Scroll down from the top of the page. All the reward tiers are on the left side of the screen starting at the top. Step 3: Select your reward. If you wish to donate money on top of the reward tier cost, please BY ALL MEANS go ahead and do so. Step 4: Put in the amount you wish to pledge. Here I've decided I want two sweatshirts, so I've multiplied $75 x 2 and put in the total. Step 5: Sign into Kickstarter or create a Login. You can also login using via Facebook. Step 6: Put in your payment information and confirm. Press Pledge and you're done! You will receive email updates as the Kickstarter goes along to update you on my status. As I said above, I only get the money if I make my $20,000 goal. Once the campaign is complete, you'll get an email letting you know how it went. If I am successful, the money will be charged to your payment option and I will send you a survey for you to select your size/color options. Wait a minute, back up! I've got some questions! What is a backer? With a Kickstarter campaign, anyone who wants to support the campaign, also called backers, can donate money to the project in exchange for various reward tiers. For the Leche Libre campaign, I have kept things very simple. 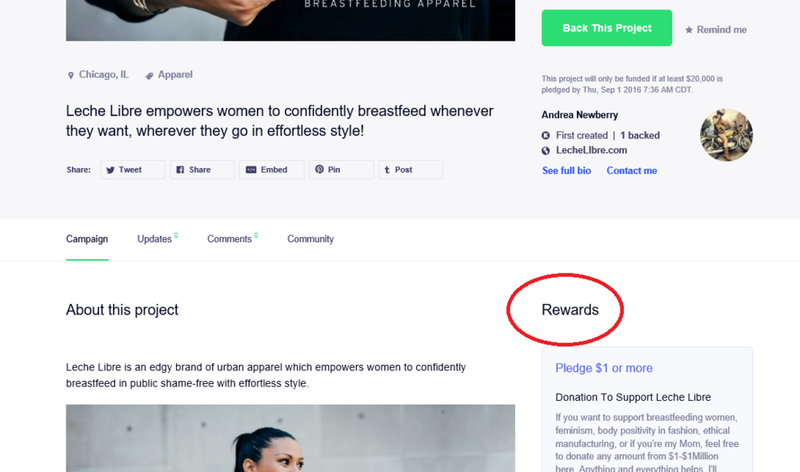 I don't need breastfeeding apparel, can I just donate money to you? Yes! I am offering 7 basic reward tiers. The first is just a straight donation of money. If you want to support Leche Libre's mission of empowering women to confidently breastfeed in public shame free but do not want any of the clothing you can opt to just donate whatever amount of money you wish using the first donation reward tier. What do I do if I want to get a dress or a sweatshirt from the new collection? The next 6 reward tiers are for preorders of my new collection. You can select any garment you would like, and donate to that reward tier. What is a preorder? It is called a preorder because the garments are not made yet. With Kickstarter, I will only get the money if I reach my $20,000 goal. Once the campaign concludes successfully, the money will be transferred to me and I will use it to begin production of the garments. If you choose a preorder, the reward tier will tell you the estimated delivery of your garment. Did I see something in your campaign about a donation to breastfeeding women in need? Yes you did! If you wish to support breastfeeding women in the Chicagoland Area. I have partnered up with the Volunteer Chicago Doula organization. Any garments which are donated will be given out to empower teen moms to confidently breastfeed their babies. Teen moms face the most obstacles to successful breastfeeding and your donation can really make a difference support women and help their babies have the best start to life. If you wish to donate a garment, just choose the garment tier you wish to donate, and preorder it. When the campaign ends, I will send you a survey and you can notate that you wish to donate your garment, and I will take care of the rest! Can you order more then one garment? Yes, of course! First check out the whole collection reward tiers. If you order all three, or all 5 (all three in all color variations) you will get an additional 5% off, at a total of 30% off. If you want to just mix and match, add up the total for the garments you want to buy and select a reward tier with one of the garments. Then enter in the total amount of clothes you want. When the campaign is over, I'll email you a survey where you can select the style/size/color mixture you wish.